Episode Prompto is a DLC for Final Fantasy XV. It releases in June 2017. It will explore the backstory of Prompto and players will be able to play as him, exploring new areas and earning new weapons that can be used in the main game. It is 4.99 USD on its own or is included in the Season Pass. 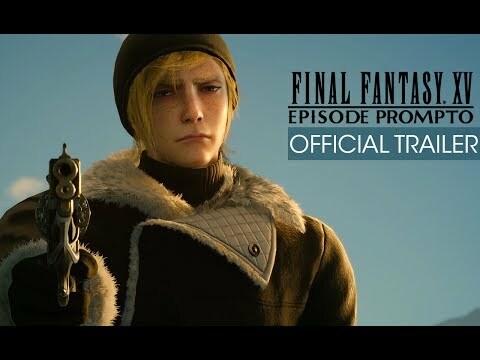 Become the gunslinger Prompto and discover the truth of his origin featuring all-new FFXV third person shooter gameplay in FFXV Episode Prompto releasing on 27th June 2017. Separated from the group and alone in an arctic environment, experience an untold story as Prompto fights to discover the truth behind his origins and to take control of his own fate. Shoot down enemies, ride the snowmobile, and snap selfies along the way as you play as Prompto for the very first time! Episode Prompto launches on June 27th for the PS4 and Xbox One, alongside an update that adds the Regalia Type-D option that gives your car a monster truck like overhaul, making it easier for off road driving.